For a forthcoming episode of Britain’s Lost Masterpieces for BBC4, I wanted to film a scene explaining one of the great artistic debates of the Italian Renaissance; disegno versus colore. 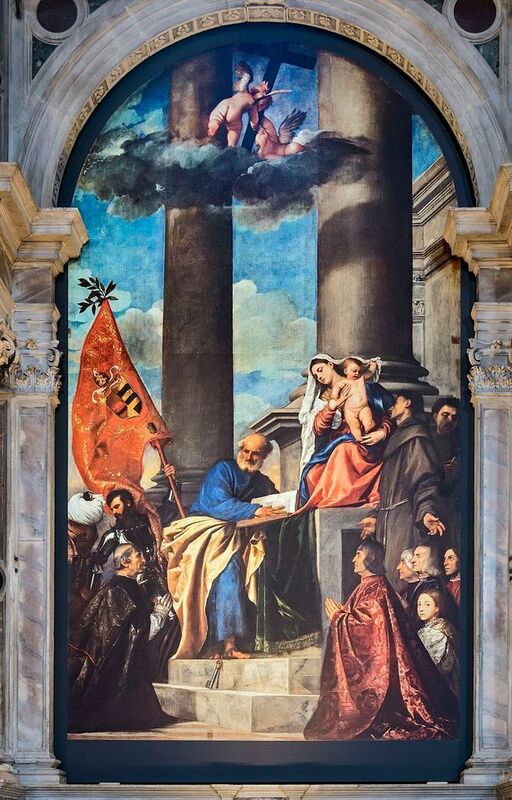 As much as I admire the drawn perfection of the works of Florentines such as Michelangelo, I have always been more of a colore man myself, as demonstrated by the vibrant brilliance of Venetians like Titian. So where better to show the superiority of colore, I told the programme’s producers, than Venice itself? Alas, BBC4 budgets are meagre affairs and Venice is an expensive city in which to film. If I was to get our producers to pay for a trip to La Serenissima, I would have to make a good case for it, and choose the perfect painting for our story. I eventually settled on Titian’s Pesaro Madonna (1519-26) in the Frari church. Here, Titian used blocks of colour to help create a pioneering composition, with the Madonna placed daringly off-centre. Best of all, the picture is full of pentimenti, where Titian changed his mind as he painted. Over time, his earlier intentions have become visible through the paint layers (he even moved an enormous background column), and these changes, I argued, would help us show that Titian did not carefully draw out his compositions first, as dictated by the disciples of disegno, but explored his way across the canvas as the picture emerged before him. Happily, the production team agreed, and the crew and I made our way to Italy. A Ryanair flight and several cheap hotels later, we found ourselves in front of the Pesaro Madonna. It was dazzling in every way, having just been restored by the charity Save Venice. The picture looked as colourful as the day Titian painted it. But there was one minor problem; all those previously visible pentimenti have been carefully touched out by the restorers, leaving my script in some disarray. On my return to the UK, I was unnerved to find that Simon Schama, in one of his episodes of the new BBC2 series Civilisations, had also tackled the disegno versus colore debate. Since that episode, called Radiance, was probably the best arts programme I have ever seen, I am not sure my effort can possibly amount to much by comparison. But at least he focused on Bellini rather than Titian. Phew. I must admit that when the Civilisations series was announced, I was sceptical that it could work. It seemed the BBC was torn between wanting to pay homage to Kenneth Clark’s brilliant original Civilisation but at the same time eschewing much that Clark had stood for. So, in place of a single personal view, as Clark’s series had been, we have three: Schama’s, Mary Beard’s and David Olusoga’s. Instead of Western culture (including literature and architecture) from the Middle Ages onwards, we have global visual art from ancient times. That is a lot of ground to cover in nine episodes. But some of the programmes have been mesmerisingly good, especially Schama’s. Like Clark, Schama makes the viewer work hard—you have to pay attention—and yet his episodes manage to be accessible to a general audience while also not patronising to specialist viewers. The reward is a more highly paced and intense hour of television than we are usually allowed these days. Add to that Schama’s faithfulness to the spirit of the first Civilisation and his aesthetic joie de vivre, and you have the recipe for some uplifting, invigorating and brilliant programmes. Although I am still not sure the series as a whole works as well as was hoped, Schama has proved himself worthy of being ranked alongside Clark himself.